Devices managed by Intune can be administered remotely using TeamViewer. TeamViewer is a third party program that you purchase separately. This topic shows you how to configure TeamViewer within Intune, and to remotely administer a device. Use a supported device. Intune-managed Android, Windows, iOS, and macOS devices support remote administration. TeamViewer may not support Windows Holographic (HoloLens), Windows Team (Surface Hub), or Windows 10 S. For supportability, see TeamViewer for any updates. Request Remote Assistance: Allows administrators to start a new remote assistance session for any user. Users with this role are not limited by any Intune role within a scope. Also, user or device groups assigned an Intune role within a scope can also request remote assistance. A TeamViewer account with the sign-in credentials. Only some TeamViewer licenses may support integration with Intune. For specific TeamViewer needs, see TeamViewer Integration Partner: Microsoft Intune. By using TeamViewer, you're allowing the TeamViewer for Intune Connector to create TeamViewer sessions, read Active Directory data, and save the TeamViewer account access token. In Microsoft Intune, select Devices, and then select TeamViewer Connector. Select Connect, and then accept the license agreement. A web page opens to the TeamViewer site. Enter your TeamViewer license credentials, and then Sign In. From the list, select the device that you want to remotely administer. In the device properties, select New Remote Assistance Session. After Intune connects to the TeamViewer service, you'll see some information about the device. Connect to start the remote session. When you start a remote session, users see a notification flag on the Company Portal app icon on their device. A notification also appears when the app opens. Users can then accept the remote assistance request. Windows devices that are enrolled using "userless" methods, such as DEM and WCD, don't show the TeamViewer notification in the Company Portal app. In these scenarios, it's recommended to use the TeamViewer portal to generate the session. 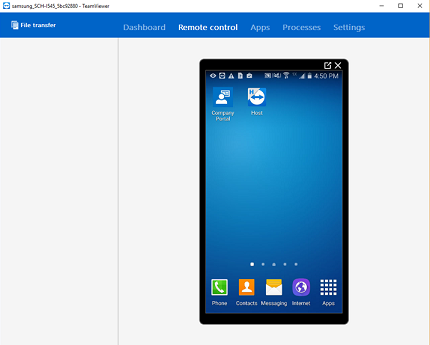 In TeamViewer, you can complete a range of actions on the device, including taking control of the device. For full details of what you can do, see the TeamViewer guidance. When finished, close the TeamViewer window.